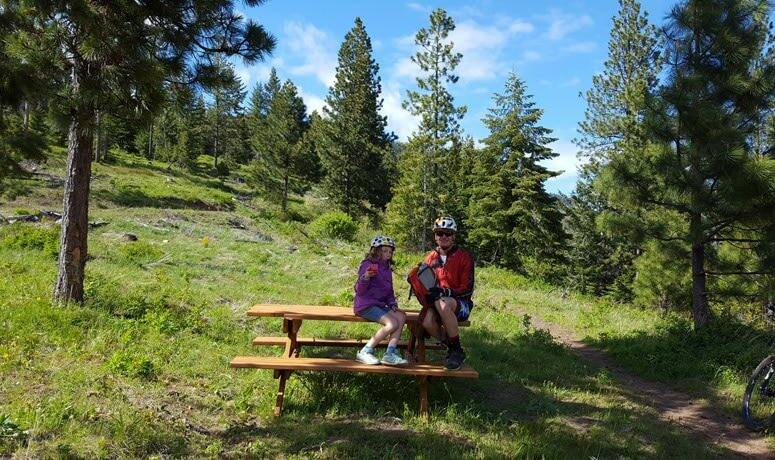 The Mount Emily Recreation Area (MERA) offers over 3,600 acres of forest recreation, including some tasty trail riding – and it’s only a few miles from La Grande, so this is an easy adventure to access. 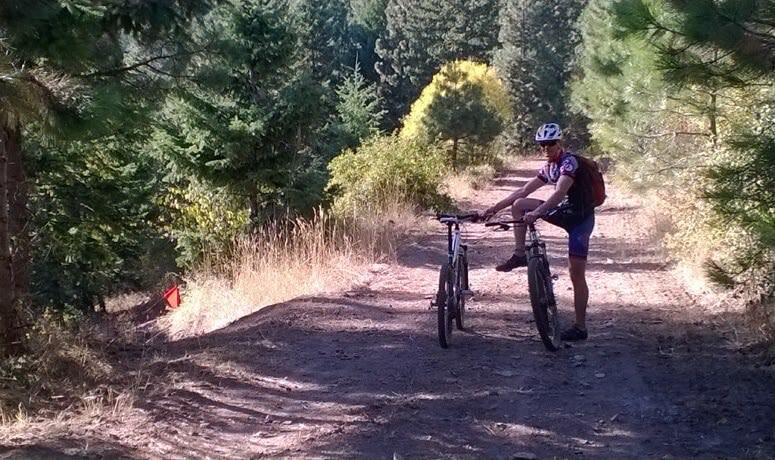 The MERA trail system gives you the chance to combine multiple segments, for a custom-built ride with panoramic Eastern Oregon views. 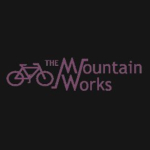 This route variation uses four different trails, resulting in almost 10 miles of riding, much of it in the more remote north section of MERA that runs up against Wallowa-Whitman National Forest land. This collection of trails delivers 1,514 feet of elevation gain and loss, featuring three separate sections of climbing with their own distinct rewards. Start your ride at the Owsley Canyon Trailhead, heading north from the parking area over a bicycle cattle guard next to a gate. This puts you onto Red Apple, also known as the 700 Trail, a favorite of walkers, runners, equestrians and cyclists – so remember to be a good trail-sharer here. Taking the option that goes east, you’ll skim down a bit before traversing a tranquil meadow that’s often filled with Camas and then rolling over a wooden bridge. You’re just getting warmed up here! Next, follow the signs to MERA Loop. When you’ve gone just over a mile total from the trailhead, at the third intersection be sure to look for the sign that says “West MERA Loop” and heads uphill. This is the first lung-expanding climb, but it only rises about 300 feet over 2-1/2 miles, and there’s a good chance you’ll be distracted from the work by the fact that you’re surrounded by rolling carpets of wildflowers. While some hard-cores consider it a sin to stop and smell the flowers, you get a pass here. Along MERA Loop there are two roadbed crossings and one major intersection where Hotshot, Zig Zag and MERA Loop meet up in the same area. Stay on the smoother and more well-traveled MERA Loop to eventually make contact with the mythical Sasquatch (trail) in the far northern reaches of the park. After completing the first climb, your payoff is a wandering trail that follows the contours of the terrain, rising and dropping in exhilarating bursts, hiding under the canopy of the coniferous forest. The respite ends when you see the 609 road and a sign plastered with various Sasquatch stickers – you’ve reached the beast, and it’s time for climb number two. Sasquatch starts with a mile-long climb that elevates about 250 feet – and the reward is an immensely satisfying view. To the west, survey a hillside that often harbors elk and displays arrowleaf balsamroot and lupine. Scan the vista to also take in a ravine cradling Conley Creek, both the Elkhorn and Eagle Cap mountain ranges, and the scattering of communities on the Grande Ronde Valley floor. After you’ve taken it all in and your breathing has returned to normal, begin a descent, dropping twice as much as you just climbed, as the trail uses the hillside’s natural topographic features to keep speed levels manageable and adventure levels high. Sasquatch then feeds into Ricochet at a road crossing, delivering you to a well-groomed trail featuring bermed corners, more challenging rollers and smooth sections to take your riding pleasure to the next level of fun. Ricochet busts through the west side of MERA Loop to finally end on an old road bed that intersects the east side of MERA Loop. At this point your outward journey has been completed; now you’ll start heading back to the trailhead. You’ll briefly travel south on the road, in the direction of La Grande; keep your eye out to the west to rejoin the trail and take on the third climb. Because it comes late in the ride, this one may seem the hardest, but the actual gain is fairly insignificant. You’ll probably cruise up it on adrenaline alone. From here, MERA Loop heads past an old gravel pit and briefly visits two roads before tying back into the West MERA Loop. 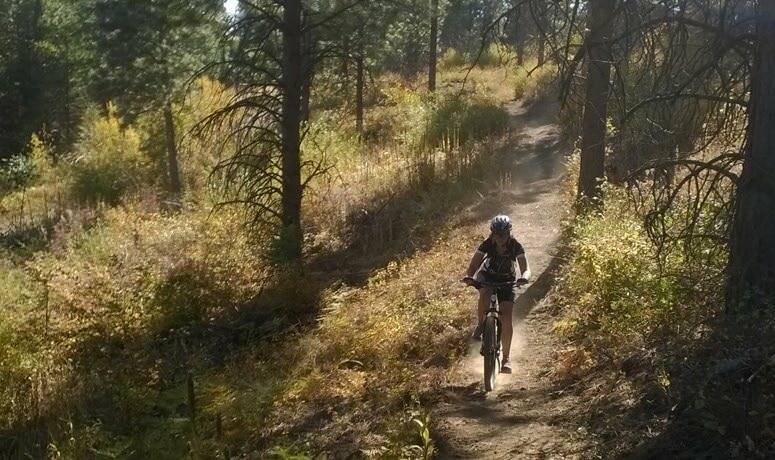 You’ll have several choices for how to finish off the ride; just follow signs to the trailhead. But a warning: When you get there you might just want to do it all again.